Can Incredibles 2 Open Huge at the Box Office After 14 Years? Warner Bros.' Ocean's 8 managed to slightly exceed expectations last weekend, ending Solo: A Star Wars Story's two-week reign atop the box office with a solid $41.6 million debut, already earning back more than half its $70 million budget. Most box office analysts aren't expecting its stay at the top to be a long one, with Disney Pixar's long-awaited sequel Incredibles 2 easily expected to take the top spot, with other newcomers Tag, Superfly, opening on Wednesday, and Race 3 also opening wide. We're predicting Incredibles 2 will win with an impressive $136.8 million this weekend. That $138.6 million figure is the same total we projected last month in our summer movie box office predictions piece, and a few weeks later, the early projections from other analysts were quite similar, with many predicting a $140 million opening weekend for Incredibles 2. That tally represents nearly double the $70.4 million opening weekend that The Incredibles put up in its opening weekend in November 2004, en route to $261.4 million domestic and $633 million worldwide, from a $92 million budget. No budget figures have been released for this sequel quite yet. Out of all the new releases this weekend, only Incredibles 2 has enough reviews for a Rotten Tomatoes rating thus far, earning an impressive 96% rating, with just two "Rotten" reviews out of 54 total. 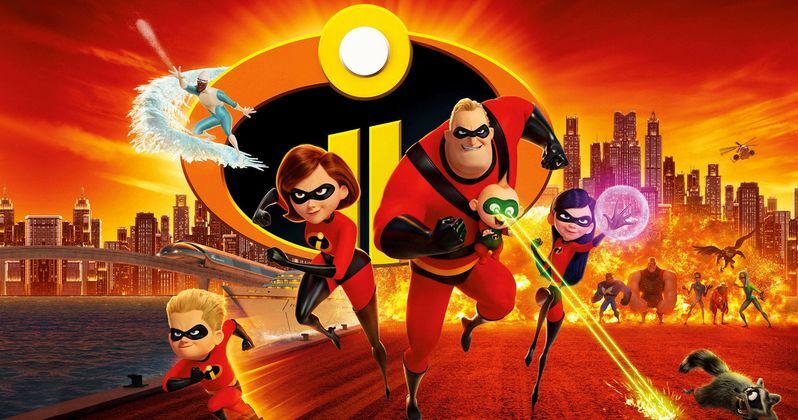 Incredibles 2 is projected to open in roughly 4,200 theaters this weekend, with Tag opening in approximately 3,300 theaters and Superfly expected to bow in 2,200 theaters. There is no projected theater count for Race 3, but seeing as both Race and Race 2 opened at less than $1 million domestically, we're guessing it will follow suit again and debut somewhere out of the top 10 this weekend. After Incredibles 2, we have the R-rated comedy Tag taking second place with $23.6 million, just barely edging out Ocean's 8, which we're projecting will drop to third place with $22.4 million, with the top 5 rounded out by Solo: A Star Wars Story with $8.2 million and Deadpool 2 with $7.4 million. Given how close Tag and Ocean's 8 are projected to fare, it's possible that they may ultimately swap spots on the charts, but we won't know for sure until the official estimates come rolling in on Sunday morning. For now, though, we're giving the edge to Tag in its opening weekend. The top 10 will likely be rounded out by Hereditary ($6.8 million), Superfly ($5.5 million), Avengers: Infinity War ($3.9 million), Adrift ($2.7 million) and Book Club ($2.1 million). Also opening in limited release this weekend is Vertical Entertainment's Gotti, IFC's Eating Animals and Strand's Gabriel and the Mountain. There is no indication as to whether any of those films will expand in the weeks and months to come. Looking ahead to next weekend, Universal's Jurassic World: Fallen Kingdom has the frame to itself as the only wide release opening in theaters, and it's expected to put up some huge numbers. Whether or not it will be bigger than the then-record-breaking debut of $208.8 million remains to be seen. Take a look at our projected top 10 for the weekend of June 15, and check back on Sunday for the top 10 estimates, courtesy of Box Office Mojo.